SPACES FOR CHANGE welcomes the Federal Government’s suspension of the public officials involved in the stealing of the police pension funds. In a statement issued yesterday, April 19, 2012 in Abuja, by Tope Ajakaiye, Deputy Director Press and Public Relations at the Office of the Head of the Civil Service of the Federation, the Federal Civil Service Commission, (FCSC) approved the suspension of the five civil servants allegedly involved in the police pension fund scam with effect from March 29, 2012. The affected civil servants include Atiku Abubakar Kigo (a Permanent Secretary), Ahmed Inuwa Wada (Director), John Yakubu Yusuf (Assistant Director), Veronica Onyegbula (Cashier) and Sani Habila Zira (ICT Officer). All five officers are currently standing trial before an Abuja High Court. Spaces for Youth Development and Social Change (SPACES FOR CHANGE) launched a petition on Monday, April 9, 2012 demanding the Federal Government to relieve the indicted officers of their positions with immediate effect until investigations and trial are concluded. We maintain that allowing the indicted officials to return to their respective posts while investigations and trial are still going on would grant the suspects unfettered access to interfere with evidence in the ongoing trial. “The 1st accused (Esai Dangabar) was the director in the Police Pension Office between 2008 and 2009. “The 2nd accused (Atiku Abubakar Kigo) was a director in the Police Pension Office between February 2010 and February 2011. “The 3rd accused (Ahmed Inuwa Wada) was a director in the Police Pension Office between February 2010 and June 2011. 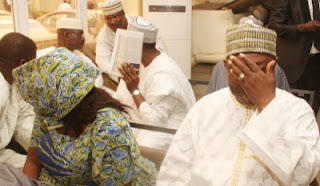 “Thee 4th accused (John Yakubu Yusufu) was an Assistant Director, accounts in the Police Pension Office between February 2009 and September 2011. The 6th accused (Sani Habila Zira) “is the Head of ICT (Information Communication Technology).